Preheat the oven to 160’C. Place the butter, cocoa, sugar, eggs and flour in a bowl and mix well until smooth. Spoon into a 20cm square slice tin lined with non-stick baking paper. 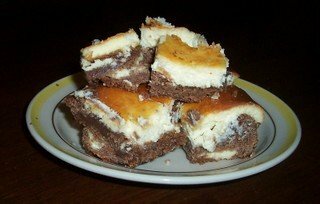 To make the cheese cake: Beat together the cream cheese, sugar and eggs until smooth. Transfer the cheesecake mixture on top of the chocolate mixture. Then Bake for 45-50 minutes or until just set. Cool in tin. Then dust with icing sugar, cut into slices and serve.